HVAC air conditioning systems are required in commercial buildings as a means of generating of cooling effects. The purpose is to offset building heat gained through many internal and external loads. Some of these loads for external influence include sun, wind and outdoor temperature heat. Indoor factors include moisture from people, lighting, and electrical or mechanical equipment. 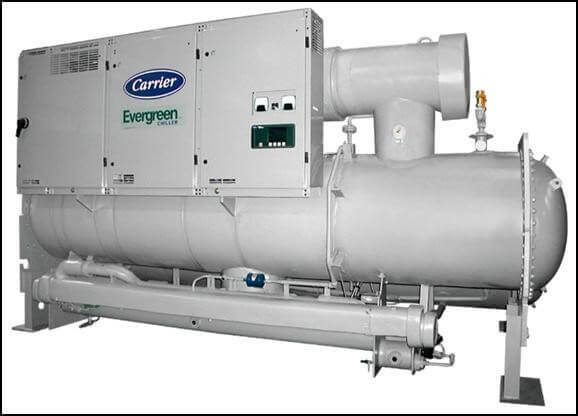 Chiller systems are installed in commercial buildings to achieve proper temperature control. There are two types: water cooled chillers and air cooled chillers. Both are refrigeration systems used to cool fluids or dehumidify air in both commercial and industrial facilities. The components that make up water-cooled chillers and air-cooled chillers are very similar. Each product contains an evaporator, condenser, compressor, and an expansion valve. The chief difference is in whether air or water is used to supply the condenser cooling. 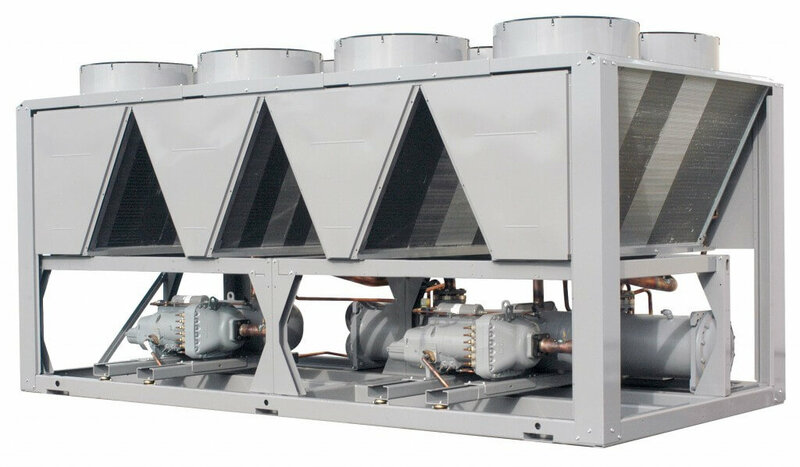 Air chillers typically are less expensive to install and don’t require cooling towers. They also don’t last as long and are less efficient than water chillers. Typically, air-cooled chillers are installed in smaller buildings, as these systems require more ductwork than water-cooled chillers. The units also contain all of their components packaged within a single cabinet, referred to as packaged cooling unit. Ductwork the runs throughout the building to each zone from the single HVAC unit. Air-cooled chillers tend to be less energy efficient, especially when the point between the base and area served is quite a distance. Efficiency also decreases if multiple areas are being serviced off one unit. If you lack space and air flow, water chillers are an excellent solution. However, water chillers do require cooling towers. Larger commercial buildings and various building campuses will use a chiller plant to provide cooling. In these systems, chilled water is generated and then piped throughout the building to other air handling units serving individual tenant spaces, single floors, or several floors. Separate ductwork then runs from each air handler to the zones. Chilled water-based systems result in far less total interior ductwork than all-air systems because chilled water piping is used to convey thermal energy from the point of the generation to the exact point of use. Additionally, a chiller-based system is more efficient regarding space utilization within the building, because components can be located elsewhere. To put it simply a chiller plant is a collection of individual components that have been selected to work together as a system. While it is more costly to install and slightly more complicated to operate, a chiller plant offers benefits over packaged cooling units. These advantages include greater energy efficiency, better controllability, and longer life. Additionally, a chiller-based system is more efficient regarding space utilization within the building, because components can be located elsewhere. Large commercial building typically houses their industrial chillers are in mechanical equipment rooms in proximity to the process in which they are cooling. Some industrial chillers may be located directly beside the process, depending on the size of the chiller and compressor. Architects and engineers may design the system to place the unit outdoors. The Severn Group has experience working with engineers and architects to assist in developing the most efficient HVAC for your building. Whether your structure is a one story strip mall or an urban highrise, we can formulate the most cost effective and energy efficient solution for your indoor regulatory climate needs. Contact us to schedule a consultation.